Hand Standing Display Black 8"
Hand Standing Display Black 14"
Hand Ladies Left Glove Display , Fleshtone 12"
Hand Ladies Right Glove Display , Fleshtone 12"
Hand Mens Left Glove Display , Fleshtone 12"
Sometimes it is not necessary to have a full mannequin to display your products on. Therefore, having individual mannequin pieces will not only save space in your store, but also allow you to highlight your product in a new way! 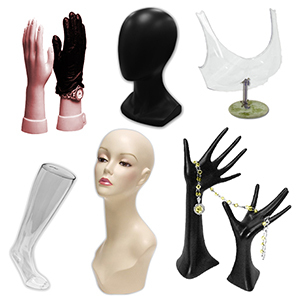 At American Retail Supply we offer a variety of individual mannequin forms from head, hands, legs, busts and more! Jewelry stores, salons and other apparel stores will be able to display their unique pieces like never before! Whether it be active wear, scarves, wigs, jewelry and more, our wide variety of mannequin forms will ensure that your products are put on display! We offer these mannequin forms in black, white, flesh tone and clear finishes. To speak to a Product Expert please contact American Retail Supply at 1-800-426-5708.